Dolores Chili announced this week that their 1-pound all beef Chili Brick is now available in all Smart & Final stores. 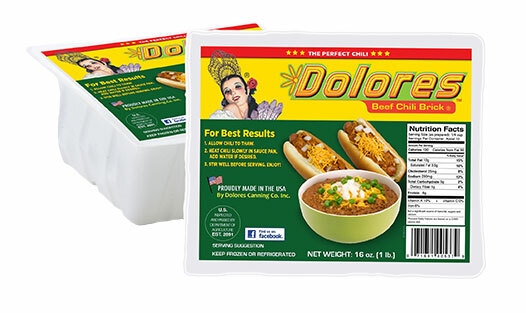 The award-winning Dolores Chili – both beef and chicken – has been available at several Smart&Final stores throughout Southern California for decades, but the addition of the 1-pound beef chili into all Smart&Final stores is exciting for chili lovers everywhere. Smart&Final has carried the 5-pound Dolores Chili tray. However, the smaller, 1-pound brick is favored by those who are looking to use it to feed fewer as a topping on burgers, hot dogs or for a side dish to complement other items. Dolores’ all beef chili is seasoned to perfection, with a hint of spice at Dolores Chili’s manufacturing plant in Los Angeles. The 1-pound brick can be found in the frozen section at Smart&Final stores. Founded in 1871, Smart & Final is a truly unique company, combining today’s state-of-the-art technologies and management practices with the historical perspective of one of the West’s pioneer companies. It prides itself in being the one-stop place for everyone’s cooking, entertaining and clean-up supplies. To find a Smart&Final store near you, visit our store locator.